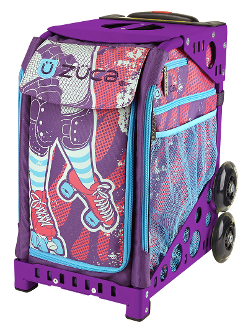 Carry your derby skates in style with the ZUCA Roller Girl Insert & Frame. Put your saucy attitude on wheels and skate your way through a jammin’, blockin’ day. Zuca bags are great for kids in competitive sports like cheer, skating, gymnastics or dance. You can use them to haul all your gear and you can sit on them when seating is limited at competitions. Can also be used as weekender bags when you purchase the Pro Packing Pouches.